I don't mind telling you that at this point in the month, I'm kind of looking forward to the end of this project. This isn't really unique to Project Gastronome; there were also points in my two movie watching projects where I hit a wall, especially when I had to watch four days in a row of Julia Roberts. I think I may have reached my capacity for self-inflicted revulsion, though, which is something that was not a factor in the other projects, except when I had to watch four days in a row of Julia Roberts. To give myself incentive to power through this final week, I've promised Courtney a steak dinner on Saturday night. And, of course, there is the Project Gastronome Wrap Party on Friday night! <Self pep-talk>These are the moments that make us. These are the moments that let us call ourselves men. 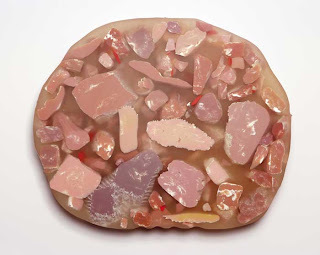 These are the moments when we will sit down in front of a video camera with our son and eat unidentifiable animal parts.</Self pep-talk> Way back at the beginning of this thing, my friend Roy left a comment telling me that I should try head cheese. Although I had a menu pretty much ready to go for the entire month, his suggestion was good enough that I decided to use the flexibility of the final week and try some. I actually didn't even know what this was until I sought it out. I mean, I'd heard of it, but the name was pretty much enough to keep me from pursuing more information. Head cheese is not a cheese at all. 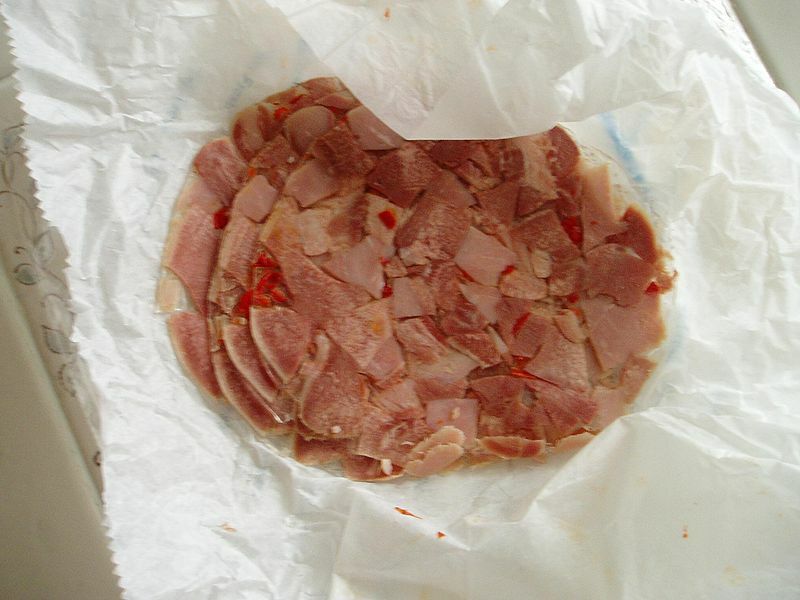 It's a cold cut made from bits of flesh from the head of a pig or cow, set into aspic (which is like a gelatin made from meat stock). On one hand, this sounds really gross. On the other hand, I used to think the same thing about barbacoa (which is cheek meat) until I tried it, and now I love that stuff. If you just look at barbacoa without knowing what it is, though, it doesn't appear off-putting. It looks like shredded brisket. Here is a picture of head cheese. It makes me think of those cadavers that they inject with a polymer and then cut into thin slices so that they can study the inside of the body layer by layer. And craziest of all is that you can buy this at practically any grocery store that has a deli counter! Speaking of buying this stuff at the store, here is a picture of my receipt. Maybe it's only funny to me, but I like that if you buy Boar's Head brand head cheese, they economize on ink and just print "BOAR HEAD CHEESE" on the receipt. Or maybe this was truth in advertising and the head cheese I am about to eat literally came from the head of a boar. Free range head cheese! Like I said in the video, at this point in the month it's far from the worst thing I've eaten, but I feel that my tongue is still poorer for having tried it. The best I can say about head cheese is that it is at least a resourceful use of animal parts which may otherwise go to waste. Except that they could probably make dog food out of those parts, too, so by eating head cheese you are depriving some poor dog somewhere of a meal that he would probably enjoy. Jerk. Bleh barbacoa! Have you tried the recipe I gave you yet? I haven't, because I know Courtney probably won't eat any. That'll be one to try next time she's out of town for a couple of days. I'm so glad you tried this because I've always wondered exactly how disgusting it is. Also, I had not clue what the texture would be like. Ava, on the other hand, was immune to ANY suggestions. Smart girl! I know! Someday I'm sure that dad's opinion will mean far less to him than it does now, but for now I sort of relish the fact that he so clearly wants to emulate me.